The Dulmont Magnum "Kookaburra" from 1983 is the only laptop to have even been design and made in Australia. Dave teards down this obscure retro classic based on the 80186. That reset button cracks me up. I don't think I've ever seen a reset button as large and easy to accidentally hit as that before. I'd love to know what they were thinking when they came up with that design. Dave, would you be able to post copies of the ROM dumps? When Dulmont went belly up, they were taken over by Time Office Computers. I worked on the software for the Kookaburra for about 12 months in 1986/87 before Time Office Computers also went belly up. The use of the 80186 caused some software problems as the interrupt vector table is in low memory and MSDOS expects that to be RAM. When booting the machine, the boot code required interrupt vectors in the same memory space, but in the ROM code. There was a sequence in the code, after MSDOS was loaded into RAM, where the processor was halted briefly while the address lines were swapped between the boot ROM and the static RAM. When it woke up again, it was now executing from the code in RAM at the same address. This required a lot of trust in the prefetch queue for processor code. As you mentioned, the processor was also halted if the software was waiting for a keystroke event. I was working on software drivers for an external RAM disk which was piggy backed onto the machine using that big external bus connector. I don't think it ever got into production and it would have been fearfully expensive as it used large quantities of static RAM. We also had external hard disks and floppy drives connected via that bus for development. Because of the architecture, it required custom software and the world was suddenly being swamped with IBM-PC compatible boxes. It didn't stand a chance, but the concept was good and the software was very professionally written. I think I still have the original source code for MS-DOS 2.11 on a dozen or so floppy disks. I doubt that they are readable now. The Tandy 2000 was a somewhat well-known machine that also used the 80186. It ran MS-DOS but also was not completely compatible with an IBM, although it was MUCH faster and had a much better graphics option with their color video board. At the time, there were some specifically designed software packages for it so you could take advantage of the increased performance and RAM capability compared to the IBM XT. Pretty much the last really decent computer Radio Shack made before switching over to more or less IBM PC clones. This is apparently not the first clamshell laptop. The Grid Compass holds that honor. 1982 vintage (designed in 1979). They held the patent on that type of design. From Wikipedia: "The form factor was first used by the laptop manufacturer GRiD (who had the patents on the idea at the time) for their Compass model in 1982." Yes, I know. Not the same Terry Crews. It's a joke. Those buttons sure are something! It is the CMOS version of the 80186. That's what the C in the beginning of the model number is for. There even is a CMOS version of the 8086 and 8088. That version is used for example in the Atari Portfolio (another portable MS-DOS compatible computer that lacks IBM PC hardware compatibility). IIRC only the CMOS version of the Intel processors feature a static design and thus are allowed to be clocked down to 0 Hz. So sleeping while waiting for keystrokes would have been impossible to implement using the NMOS 80186. Awesome, thanks for joining and sharing that! If the system was designed for battery power, would using LSTTL be detrimental? Or was HCT or HC too expensive to even try in '84. On reason may have been that HCT was introduced in 1982, so availability of various gates may have been an issue. [EDIT] Answering my own question: LSTTL is 2 mW/gate and HCT is 0.5 mW/gate at 1 MHz. So the power savings are not that remarkable. Last thought: this is less a laptop and more a very large PDA, like a Palm Pilot, etc. Where is the retro EEVblog intro? edit: It surprises me that the display is still so good. I have a slightly smaller (graphic) LCD display from the same era but it is black around the edges and I have no idea if it still works. I have not turned it on for the past 20 years. Interesting hardware. I was surprised to find a 80186 in a Spider Systems SpiderPort RS-232 terminal concentrator. Similar hardware inside; 256K RAM, socketed ROMs for the firmware, though they used Zilog serial port drivers (Z-80 SIO, IIRC). Last time I switched it on, most of the tantalum caps on the top two interface boards popped, so I'm not sure how many ports actually work now, but it had 10 - with 4 per board, plus 2 on the main system board. Kinda funny that Dave mentions that these old electronics never really break. IMO the real golden age for consumer electronics as far as longevity goes, was the early 2000s HP/Dell high-end laptops. Up to 2 years ago I still had an awesome Dell Latitude with 4:3 1600x1200 screen from 2001. Internally, it was impeccable. No mods, all connections were strain relieved, the battery was in its own plastic shell so it wouldn't damage boards when it leaked (and it did - had to replace it), hinges were PTFE/hardened steel based so they will probably last until the end of humanity, even the fan motor had a single-shielded ball bearing. I mean, you would pay the equivalent of $8000 in today's money back then, so that will definitely have had a lot to do with it, but still. No contest. Could the ROMs be byte-interleaved or something? and interleave the letters, you get "Use the up and down arrows..."
They could have interleaved by bits (or done any other crazy re-arrangement), but splitting the bytes like this makes it easier to prepare the ROMs. You just have to take every other byte, rather than splitting them up into individual bits. It's stretching my memory a bit, but I believe EPROM programming software would often have an option to do this for you. Good tear down. I enjoyed it. Many of those chips I remember. Ah, the good old days. The 80186. We build about 200,000 machines in IBM Wangaratta using that processor, in the KDT (Kanji Display Terminal) and project Azalea which was also a dumb Kanji terminal but with a diskette drive. All were exported to Asia - the vast majority to Japan. We also built about 2 million genuine IBM PC's there, from 8086 to Pentiums, as well as Apple power brick processors for the Power Mac, RS/6000 systems and host of other stuff. We made all the motherboards there too. In 1995 we were the biggest exporter in $ terms of non-primary produce in Australia. But I do not recall us ever building laptops in Australia. Dave is right. It is quite likely that it was the only Australian made laptop. Dave should have checked the CR2032 terminal voltage. Probably zero, unless someone had replaced it. A 32 year old battery. I first wondered about this. That package is WAY too big to be a DRAM. However, then I realized the truth -- no disk drive at all! No hard drive, no floppy drive. This thing uses a RAM disk, so you are almost forced to use SRAM so that you can have a battery back up. I guess that you could use a battery to power DRAM, but I suspect that would take a lot more power. Thanks so much for sending this along; I got a huge kick out of it. (*) You're right there was no removable R/W storage in 'laptop' mode; the 'disks' that MSDOS saw were implemented in RAM. You added removable storage by connecting the dual floppy drives via the parallel connector that you noted on the back. (*) I wasn’t the original designer; I was brought in to run the software team (once Barry had the prototype hardware up), which I did throughout. Chris T was brought on later to run the hardware team; he and I worked together. Terry Crews was originally hired before me as engineering manager before me but it was immediately clear that he had no clue what he was doing in that role; they made him marketing manager, where he was responsible for those remarkable ads that you cited. (*) The parallel port wasn’t really custom – was a standard configuration for that era. (*) The RCA connector was a video port, as you note later. (*) 6:46 is classic, but in Barry's defence the model you have there is some weird prototype; hence all the kludges and the handwritten labels. (*) The 80186 was NMOS, as you note. That was kind of the miracle here. Barry and I didn’t want CMOS because they were so so slow. But NMOS consumed a lot of power. The solution was to mod MSDOS so that the CPU and all of its support could be powered off between keystrokes; each time you hit a key, the 186 would come up from cold, and transparently reenter the OS. As you note. Gave us all of the performance of a PC and great battery life. We were much faster than 8088 desktops of the time. (*) You Got It Working!!!! That’s so great! Congratulations. (*) The tirade at the end isn’t really fair – this was a prototype between the Magnum and the Kookaburra . None of the points you make about removable store, video etc are correct – remember that when you plugged in a video monitor and disks, this was the fastest desktop PC of the time, that you could also take on the road. 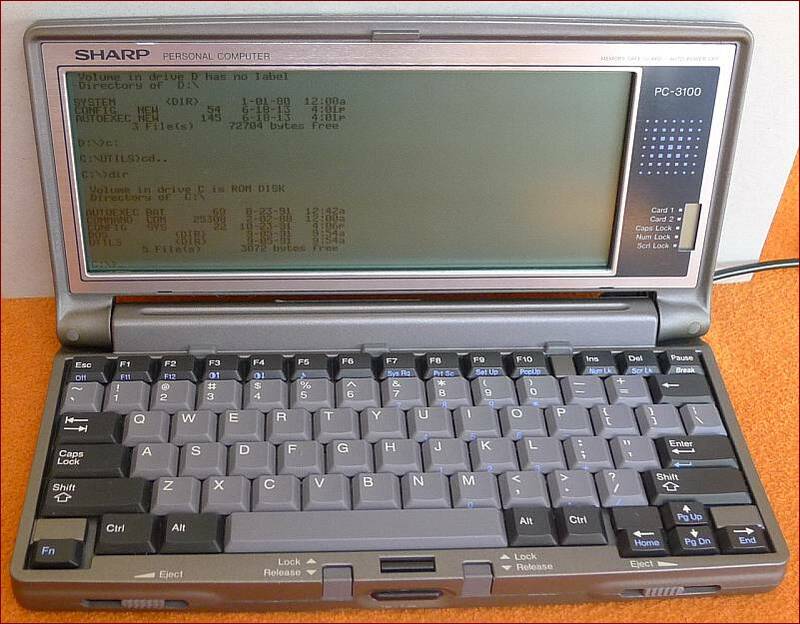 I have a Sharp PC3100 in working condition. It's actually a cool little machine and has the best keyboard I've used on a palmtop (the keys are probably 80% of a full sized keyboard's). It has MS-DOS 3.3 in ROM also. Storage was by way of PCMCIA card (battery backed SRAM cards -- I have a whopping 2MB). This did come well after the Kookaburra though. Thanks for the video. Never would have guessed the 186. I have an old HP computer that looks something like it. Also has DOS in ROM. Looks to be a little smaller. Had the old HPIL serial bus to control my HP meter. Looking forward to seeing the next one you pull out.